Pre-qualified Aggregate Supplier Program (Supplement 1069). Provide aggregate materials to the Ohio Department of Transportation from pre-qualified suppliers. E. Steel Slag Aggregate. Provide open-hearth (OH), basic oxygen furnace (BOF), and electric arc furnace (EAF) steel slag aggregate (known as steel slag) according to the following requirements when 703.04 aggregate for asphalt concrete base or 703.05 aggregate for asphalt intermediate course is specified. Do not use OH, BOF, or EAF slag as the fine or coarse aggregate (virgin or recycled) for asphalt surface courses. Supply all steel slag from sources according to Supplement 1071. Furnish steel slag to a size meeting the specified grading requirements. Provide steel slag aggregate meeting the specified coarse or fine aggregate quality requirements. Ensure that measurements of soft pieces includes soft lime, lime oxide, or magnesia agglomerations or any foreign materials prone to rapid disintegration under construction processing and weathering conditions. Ensure that additional testing beyond those listed are performed or required any time poor quality steel slag is suspected due to visual inspection, testing, or field performance problems. Quality control records (created in accordance with Supplement 1071). Failure to follow the processor QC plan or continued problems with performance recognized by the Laboratory attributable to steel slag is cause for limiting steel slag use from that processor. F. Restrictions. When an aggregate source is specially designated with a “SR or SRH” according to Guidelines for Maintaining Adequate Pavement Friction in Surface Pavements, the aggregate source will be restricted for use in surface pavement according to the methods in the guidelines. The document, Guidelines for Maintaining Adequate Pavement Friction in Surface Pavements, is available on the OMM website under “Material Information by Category, Aggregate”, or the Office of Pavement Engineering’s website. 1. Provide fine aggregate consisting of natural sand or sand manufactured from stone. Provide fine aggregate for Items 255, 256, 451, 452, 526, and 511 deck slabs with at least 25 percent siliceous particles as determined by the acid insoluble residue test [ASTM D3042]. Ensure material has been tested and results are on file at the Laboratory. For sources not tested and on file at the laboratory, submit certified test data from an AMRL accredited independent laboratory verifying the minimum 25 percent. When tested for the effect of organic impurities on strength of mortar, ensure that the compressive strength of mortar made with untreated sand is not less than 95 percent of the compressive strength of mortar made with treated sand. A. Provide coarse aggregate for asphalt concrete base used in combination with rigid pavement consisting of CCS, gravel, or crushed ACBFS. Provide coarse aggregate for asphalt concrete base used in flexible pavements consisting of CCS, gravel (see note  in table below), or crushed ACBFS. Provide fine aggregate for asphalt concrete base consisting of natural sand or sand manufactured from stone, gravel, or ACBFS. Crushed Steel Slag (OH, EAF or BOF) conforming to 703.01.E and 401.03 may be used for coarse and fine aggregate in asphalt concrete base used in flexible pavements. If the MD value is greater than the specification limit conform to Supplement 1010. 1. Provide fine aggregate consisting of natural sand or sand manufactured from stone, gravel, ACBFS or, for intermediate courses only, steel slag (OH, EAF or BOF) conforming to 703.01.E and 401.03. 1. Provide coarse aggregate consisting of CCS, crushed ACBFS, washed gravel, or for intermediate courses only, steel slag (OH, EAF or BOF) conforming to 703.01.E and 401.03. C. General Requirements for Fine Aggregate. For fine aggregate calculate each individual sieve fraction soundness loss and ensure that the fractional size does not exceed 13.0 percent for all surface courses, intermediate courses and any asphalt concrete course directly below an open graded friction course. A. Furnish sand cover consisting of natural sand or sand manufactured from stone or ACBFS. A. Furnish mineral filler consisting of limestone dust, portland cement, or other inert mineral matter. Ensure the mineral filler is thoroughly dry and free from lumps. A. Furnish screenings for No. 10 size gravel, stone, or ACBFS. Where crushed material is specified, ensure that it is crushed from material larger than the 1/2-inch (12.5 mm) sieve. 703.11 Structural Backfill for 611 Bedding and Backfill. Furnish structural backfill for 611 bedding and backfill consisting of CCS, gravel, natural sand, sand manufactured from stone, foundry sand, ACBFS, GS, or RPCC. Furnish granulated slag according to 703.08. Do not use GS for Type 3 Structural Backfill. 1. Furnish Type 1 structural backfill that meets the gradations of Items 304, 411, or 617, except 0 to 20 percent may pass the No. 200 sieve. Furnish Type 3 structural backfill that meets the gradations of Size No. 57 or 67 from Table 703.01-1. Ensure that the portion of the material passing through the No. 40 (425 µm) sieve has a maximum liquid limit of 25 and a maximum plasticity index of 6. Ensure that the portion of the material passing through the No. 40 (425 µm) sieve has a maximum liquid limit of 25 and a maximum plastic index of 6. 703.13 Coarse Aggregate for Items 305, 451 and 452. In addition to the requirements of 703.02, the following aggregate requirements apply. When the total combined quantity of the listed items is greater than 10,000 square yards (8000 m2), provide size No. 57 or 67 from Table 703.01-1. If the total combined quantity of the listed items is less than 10,000 square yards (8000 m2), then provide one of the following sizes from Table 703.01-1: No. 7, 78, 8, 57, or 67. If gravel or limestone No. 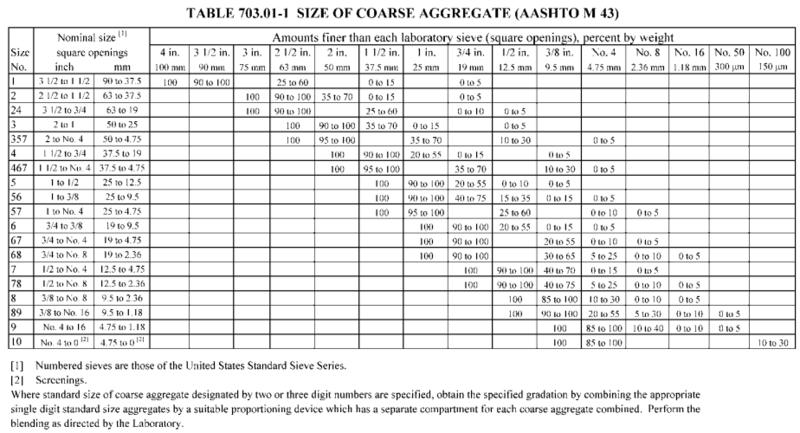 57 or 67 size is selected in either of the above cases, then ensure that the coarse aggregate incorporated into the concrete is tested according to ASTM C 666, Procedure B. Ensure that the area generated under the curve obtained by plotting the expansions of test specimens verses the number of test cycles does not exceed 2.05 at 350 or less cycles. 703.14 Non Pavement Open-Hearth, Electric Arc Furnace, and Basic Oxygen Furnace Steel Slag Aggregate Use. Provide steel slag according to the following requirements. 1. Non-confined Applications. When using OH, EAF, and BOF slag in applications where the steel slag will not be confined, ensure that the slag meets the requirements in 703.14.A (deleterious substances and crushing), and in 703.14.B (aging and stockpiling requirements). Recycled steel slag from Department or non-Department projects may be used in applications where the recycled steel slag will not be confined. 2. Confined Applications. When using OH, EAF, and BOF slag in applications where the steel slag will be confined, ensure the steel slag meets all requirements of 703.14. The use of recycled steel slag from Department or non-Department projects is not allowed in confined applications. Furnish steel slag with less than 3 percent deleterious substances (soft pieces) by weight. The Department will use Supplement 1029 (hand crushing of soft pieces) to determine the soft pieces. Crushing of steel slag is not allowed. 1. Grade and stockpile the material into maximum size piles of 25,000 ton (23,000 metric tons). Before and during the stockpiling operation, add water to these materials to provide a uniform moisture content not less than their absorbed moisture. Ensure that the stockpile is maintained in a moist condition during the required stockpiling period. C. Identification of Steel Slag. Clear, definitive, and undisputable identification of the proposed material being steel slag is required. 5. Type of steel furnace(s). This identification of steel slag and the source may be supplemented by other information approved by the Department or by using 10 years of good performance data. Ensure that the producer submits to the Department projects where the steel slag has been used without expansion or tufa problems. The Department will review the above projects as part of the identification approval process. D. Tufa Performance Verification of Steel Slag. Tufa is a precipitate form of calcium carbonate that can clog up the underdrain systems. Some steel slag sources clog up underdrain systems and some do not. Tufa performance verification is based on field performance and Department’s inspection of the underdrain systems. Ensure that the producer submits past projects that are at least 10 years old that used the proposed steel slag source to the Department. The Department may consider projects that are less than 10 years old for tufa performance verification if it can be determined by the Department that the age of the steel slag incorporated in the project was 10 years old or greater. Ensure the producer supplies the Department with construction plans with the underdrains and underdrain outlets marked on the plans, or other suitable method, approved by the Department, showing the underdrain system. Ensure the producer marks the underdrain outlets in the field for inspection. The Department will inspect the underdrain systems for tufa deposits. If tufa deposits are found in the outlets or in the underdrain system, the Department will reject the steel slag source. E. Expansion Testing of Steel Slag. After the aging and stockpiling requirements are met, expansion testing is required for steel slag. Perform expansion testing for every 2500 tons (2300 metric tons) or fraction thereof of the material stockpiled in accordance with 703.14.B. For steel slag less than 10 years old, retain a spilt portion of the expansion sample. Reduce the split sample to 5 lbs (2500 g) and test for total percent MgO by X-Ray florescence and total percent periclase (hard burned MgO) by X-Ray diffraction. Submit the expansion test data and a suitably presented summary of the expansion test data to the Department for approval. Submit X-Ray florescence and X-Ray diffraction data to the Department. The Department reserves the right to perform independent testing to verify the laboratory results at any time. If the material fails the expansion testing, then stockpile the material for a minimum of two additional months from the date of last sampling and retest for expansion. Only materials that pass the expansion test are approved for use. Furnish RPCC with the reinforcing steel cut to a maximum length of 1 inch (25 mm) outside the pieces. Ensure that pieces of RACP do not exceed 4 inches (100 mm) in the largest dimension. Furnish steel slag according to 703.14. When using steel slag, RPCC, or RACP, completely blend it with at least 30 percent natural soil or natural granular material. When using coal, completely blend it with natural soil or natural granular materials. Make at least 90 percent of the blend natural soil or natural granular materials. A. Natural Soils. Furnish natural soils as defined in 203.02.I and classified as Department Group Classifications A-4-a, A-4-b, A-6-a, A‑6‑b, and A-7-6 as further defined below: Furnish soils with a maximum dry density of at least 90 pounds per cubic foot (1450 kg/m3). C. Granular Material Types. Furnish CCS, gravel, ACBFS, durable sandstone, durable siltstone, GS, or blended natural soil or natural granular materials blended with OH, BOF, EAF, or RPCC as detailed above. Furnish durable sandstone and siltstone with a slake durability index greater than 90 percent according to ASTM D 4644. 2. Granular Material Type B. For Item 204, furnish the gradation of Items 304, 411, or 617. For Item 203, furnish the gradation of Items 304, 411, or 617 except 0 to 20 percent will be allowed to pass the No. 200 (75 μm) sieve. 1. Obtain a piece of shale that is typical and representative of the rest of the shale. The size of the piece should be about 6 inches (150 mm). If a 6-inch (150 mm) sample is not available, then the shale is nondurable. 2. Place the piece of shale in a bucket of water. Examine the deterioration or slaking of the shale after 48 hours. If the shale has deteriorated, then the shale is nondurable. 3. If the shale has not deteriorated after being in water for 48 hours, then break down the shale over a 3/4 inch (19.0 mm) sieve by hand pressure. If 75 percent or less of the shale is retained on the 3/4 inch (19.0 mm), then the shale is nondurable. 4. If more than 75 percent of the shale is retained on the 3/4 inch (19.0 mm) sieve or, then perform a field test for durability. The field test for durability consists of compacting the shale with six passes of a steel drum roller which has a minimum compaction force of 500 pounds per lineal inch (57 kN/mm) of roller drum width. Provide documentation to the Engineer to verify the roller meets the compaction force requirement. a. If more than 40 percent of the shale breaks down, by visual inspection, then the shale is nondurable. b. If less than 40 percent of the shale breaks down, by visual inspection, then the shale is durable. 703.17 Aggregate Materials for 304. Furnish aggregate that is CCS, crushed gravel, crushed ACBFS, GS, or steel slag. Except for GS, ensure that the portion of the material passing through the No. 40 (425 µm) sieve has a maximum liquid limit of 25 and a maximum plasticity index of 6. Use ACBFS according to Supplement 1027. Where the major portion of the material in a coarse aggregate, from a source on record at the Laboratory, has shown the characteristics of acquiring a mud-like condition when tested for soundness, test it for soundness and ensure that the maximum loss is 5 percent. Use ACBFS slag according to Supplement 1027. For a filter for rock channel protection, use Size No. 3 or 4 from Table 703.01-1. Except for RPCC, test for soundness according to ASTM D 5240. Use materials having a maximum 30 percent single slab loss and a maximum 20 percent cumulative loss. Slab heights and lengths will be a minimum of 8 inches. For RPCC, test for soundness according to AASHTO T 103 as stated in 703.18.A.